The Satirical Christian: Durham Twelve Saved! Following on from our earlier report, the Church Commissioners are delighted to announce that the Durham 12 have been saved from eviction by a generous donation of £15m by an investment manager. The Church Commissioners had planned to sell the famous paintings to save on insurance and use the money raised for mission and ministry. But now, the extra-ordinary generosity of this gift will ensure that the paintings can stay, (although still more money will be needed to develop them as a visitor attraction). The Bishop of London celebrated the donation saying that it “has made that rarest of scenarios possible: the best of both worlds”. Alternatively the donation could have provided access to safe water, sanitation, and hygiene education to 1 Million people. Doubtless people living in poverty in sub-Saharan Africa will be just as delighted that this act of generosity will be used to ‘save’ these paintings. 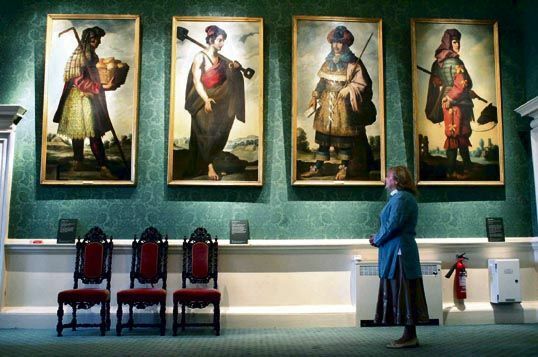 It has also emerged that the £15m donation will be spent on creating a charitable trust for the paintings, not for mission and ministry, as was planned if the paintings had been sold. So hats off to the Church Commissioners for ensuring that the most important things have been ‘saved’ – not the million people in poverty whose lives will continue to be at risk from water-borne diseases – not the people who would might have been spiritually ‘saved’ by financing mission, ministry and evangelism in the Church of England – but the paintings. It is a difficult balancing act – maintaining heritage and providing for the developing world. Personally I find it odd how people go into delights of ecstasy over some mouldy old picture or a clapped out old building. I am a member of the National Trust and I do enjoy galleries and old buildings, but the fact the NT has a half billion turnover a year is rather staggering when you think the Salvation Army’s (in the UK) is around a hundred million (though almost 80% of this comes from the taxpayer). Yet just throwing money at the developing world is not the answer either. For many years I worked in social work and this has resulted in a major shift in my thinking about welfare and helping people. In the UK the welfare state has resulted in a disproportionate number of people becoming overly reliant on the state and not taking enough responsibility for their own actions. There is now an increasing body of evidence to suggest aid in the developing world has had the same effect on some populations. Certainly the action of just throwing money at problems hasn’t worked (I’m sure Mr Blair and Mr Brown can vouch for that one, here in the UK!). In Africa there has been a good deal of dependence created by aid. I do support Oxfam, simply because it is part of its ethos to promote independence and self-reliance. And personally I believe birth control should be part and parcel of aid provision. In addition there is the unsaid, though often implied, assumption that people in the developing world are hapless victims and are not in control of their own destinies or are not responsible for their own situation. Which is actually a subtle form of racism. Helping the developing world is fraught with such dangers! This seems to be the case, even our charity can have selfish ends – even if it is just to make ourselves feel better about ourselves. Hence the reason why I don’t get too upset about some old daubs at the Bishop’s palace being saved. What ‘developed’ Europe? Good government. Many African countries have money (Cote d’Ivory is a good example) but have a habit of spending it on arms and a good deal is siphoned off through corruption (as is a good deal of aid money!). It is good government that will save Africa in the end, no matter how much money and guilt offerings we give.